The day has finally come, it’s time to talk about the okapi! If you were previously unaware of this fine stripey-butted creature, you might be inclined to believe that it was the result of some overly creative mad zoologist, bent on breeding stripes into every animal possible. I mean really, they’ve made ligers by breeding lions with tigers, and zonkeys by breeding zebras and donkeys (seriously, check that one out, it’s amazing), so it’s only logical that this okapi creature would be the result of a zebra bred with a… a… llama, I guess? 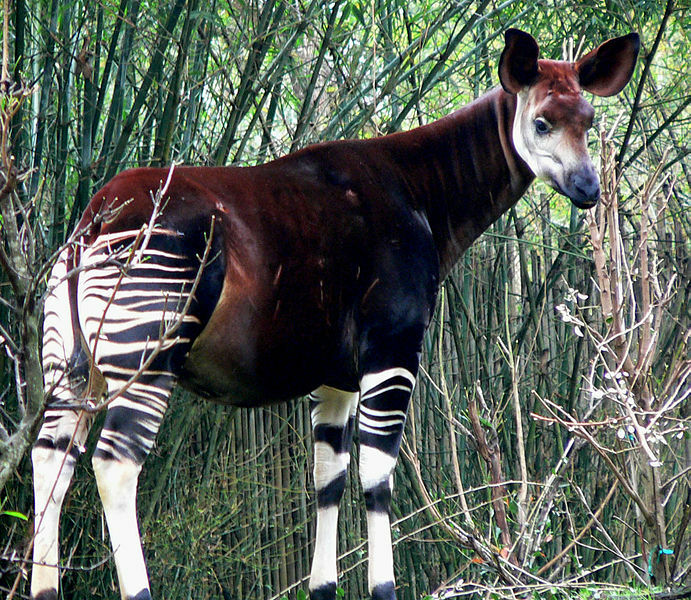 Well, it turns out that we have good old fashioned evolution to thank for the okapi. Their closest relative is, surprisingly, not the zebra, but the giraffe. You wouldn’t guess it by the markings, but the relation starts to become clear the second you start comparing their tongues (which, obviously, you do almost immediately). Okapis and Giraffes both have these amazingly disgusting, incredibly long, blue/black prehensile tongues. They use them to strip leaves from trees, and then while they’re at it, they go ahead and use them to clean their eyelids and the insides of their ears. 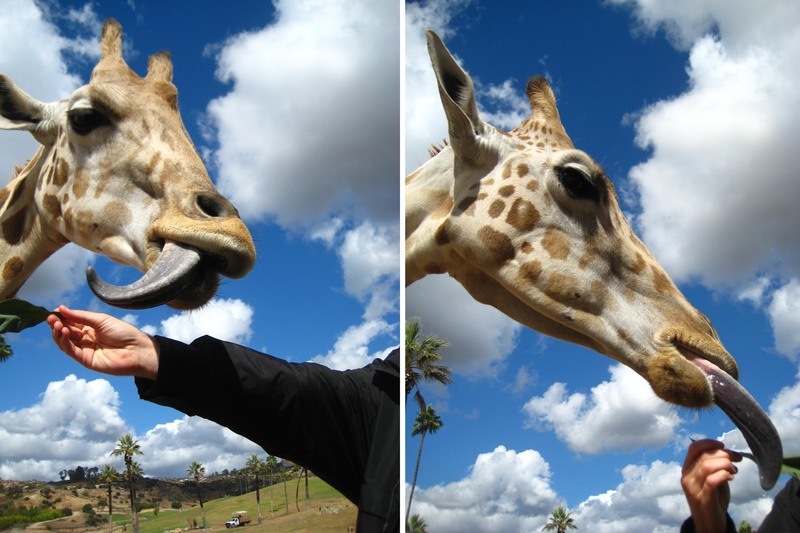 This tongue belongs to a giraffe (duh), but you get the idea. We met him at the San Diego Wild Animal Park, and fed him leaves. They have an okapi there too…but we didn’t get to feed him any leaves. 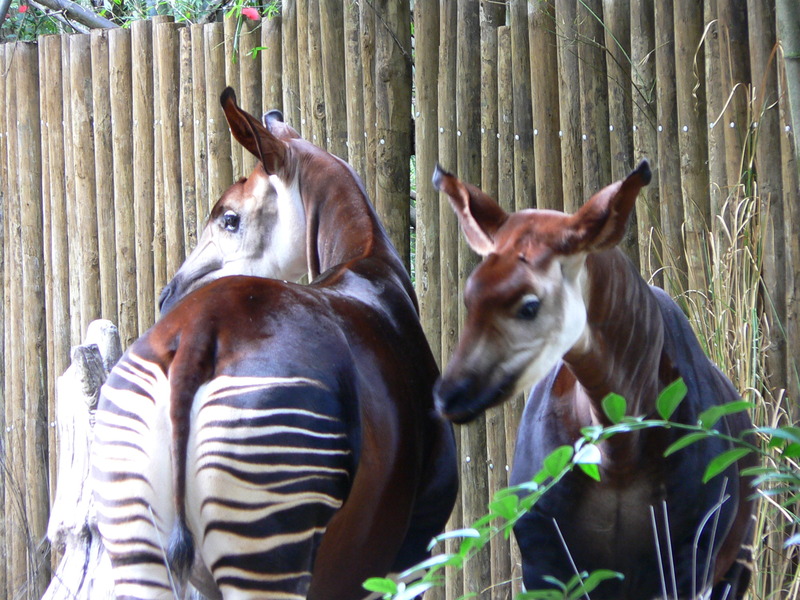 Okapis are native to the Ituri Rainforest, which is in the Northeast of the Democratic Republic of Congo. Their stripes, in addition to being awesome, help them to stay camouflaged in the forest, and their giant ears allow them to hear predators from afar and steer clear of danger (nobody WANTS to get eaten by a leopard, when it comes right down to it). The males grow these cute little pointy horns that face backwards so as not to get caught on any branches. Okapis are solitary animals, and generally don’t hang out, unless they’re a mother and baby, but they do manage to keep in contact…disgustingly, of course. They have these scent glands on their feet that produce this stinky tar-like gook that they leave behind them as they walk, thus alerting the other okapis of their whereabouts. The males also spray pee all over the place to mark their territory, but it pretty much seems like all male animals do that, so I’m not going to consider it special or interesting. Moving on. I recently considered how horrifying the okapi’s face would be if he didn’t have any ears. Seriously, look at the pictures and imagine him with no ears. He looks like some sort of an evil skeleton. But then, put the ears back on, allow the stripes back into your field of vision, he’s cute, all over again!! So…have I convinced any skeptics that the okapi should be worshipped? I hope so, I’m big into okapi worship, myself. If you’d like to sport an okapi on your t-shirt, or your kid’s shirt, on the off-chance that you don’t already have a closet full of okapi t-shirts, then check out my shop!